Viewing time: 4 min. 15 sec. The Write Question is a weekly video podcast all about writing. 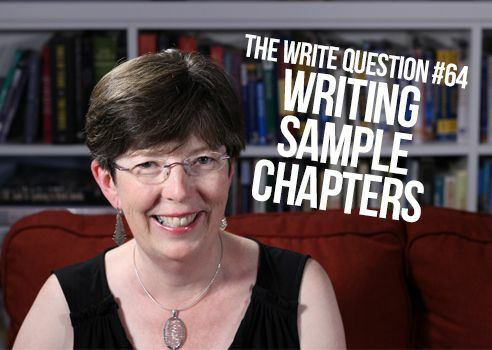 Today’s question focuses on how to write sample chapters for book publishers. If you have a question you’d like me to answer, email me at daphne@publicationcoach.com, tweet me @pubcoach, or leave a message for me at the Skype account, The Write Question. Welcome to The Write Question. I’m Daphne Gray-Grant. Today I’m talking about how to deal with writing sample chapters for publishers. Today, I have a question from reader Asad Asadi, who is based in Amol, Iran. Here’s what he’s asked. Thanks for the question, Asad. Congratulations on getting the interest of Oxford University Press. That’s quite a coup. But it’s also quite intimidating. The fear you are feeling — and it is fear not demotivation — arises out of your concern about whether your work will be good enough to meet their standard. Feel the fear. Acknowledge it. And then decide you’re going to do your work regardless. I’m including a link below to a blog post on fear that you might find helpful. Writing an entire book — which will be a minimum of 50,000 to 60,000 words — is a time-consuming, intimidating process. But writing two chapters is much faster and simpler. Each chapter will need to be somewhere between 4,000 and 9,000 words. You can do that! You can even do it while you’re teaching. It’s just a question of making the time for it. I suggest you put aside 15 minutes first thing every morning to work on it. You can probably write 200 words — the length of an email — in these 15 minutes. I know that 200 words might not sound like much, but do the arithmetic. That will add up to a thousand words a week and that means you’ll be able to write each chapter in somewhere between four and nine weeks. If you’d done that after Christmas, you’d have three chapters by now! There’s no magic to writing a book. It’s just hard diligent work that you do day after day, whether you feel like it or not. Whether you feel fearful or not. If you start to become worried that Oxford University Press won’t find your writing good enough, comfort yourself with the knowledge that good writing never appears in the first draft. ALL writers, even famous, well-established ones, produce crappy first drafts. I’ve written a blog post on this topic and I’ve copied the link below. Good writing comes from diligent editing. But you can’t edit a blank page. So, get your words on paper as quickly as possible and then spend significant time buffing and polishing them to make them better. When you are writing, write. When you are editing, edit. When you are dealing with potential publishers, deal with potential publishers. Remember that these are three separate jobs and they require three different types of attention. Don’t compromise your ability to do one by focusing on a different one. Thanks for the question, Asad. You are closing in on quite a rabbit with Oxford University Press. Don’t let it escape your grasp!